TIP: Any all purpose gf flour will do. We like Bob’s Red Mill for anything that resembles pie crust. Preheat oven to 350 degrees and lightly grease a 9 x 9 inch pan. Add gf flour, xanthan gum, brown sugar, soda, and salt to food processor. Pulse to combine. Add butter and pulse until mixture comes together in large crumbles. Add oats and pulse to just mix them in – or mix them into the crumble by hand. Press 2/3 of the mixture into the bottom of your pan. In sauce pan, combine dates, white sugar and water. Bring to a boil and simmer until the dates are mushy. You may need to add water if the mixture becomes too dry. Spread the date filling over the bottom layer of pressed crumble. Now sprinkle the final third of the crumb mixture over top of the filling and lightly press it into the filling. Bake for 30 minutes, or until the top turns a golden brown colour. This recipe is a conversion of Jean Paré’s version of Matrimonial Squares. Photo credit: gfandme.com. Plate is “The Engagement” from the Brambly Hedge Series by Royal Doulton. This entry was posted in Baking, Recipes and tagged bob's red mill, Cake, gluten free, square. Bookmark the permalink. I see why the flavors marry well. Dates: yes, please! Wow! This looks so delightful! Oooh! I have a bag of dates sitting on the kitchen table, and I love oats – must try this one out. I’ve never heard of ‘matrimonial squares’ before (I’m a UK southerner now living in the midlands) but I love the name. I like the name too. Let me know how they turn out. Hope you enjoy them as much as we do! We have a similar concept in Australia, which we just call “slice”. 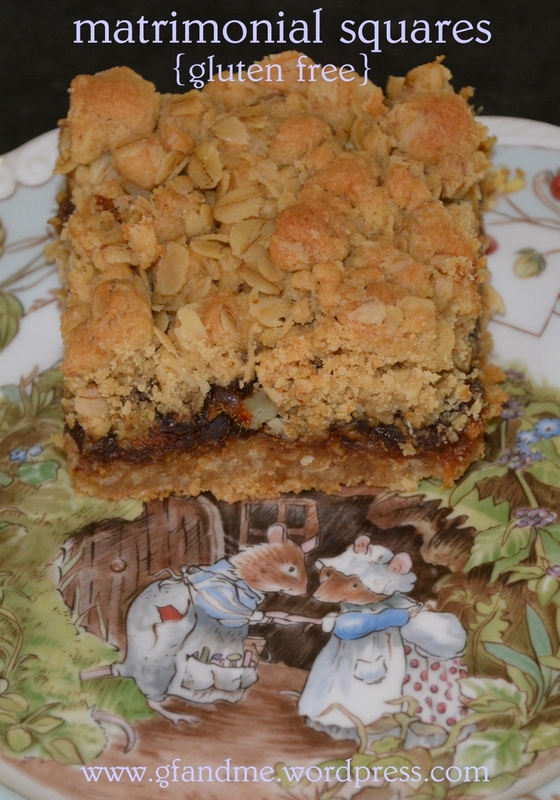 Biscuity (cookie) base, jam filling and oaty, coconutty or biscuity topping. YUM! don’t need to buy it. I love that What’s next? Thanks. GF is expensive, which is too bad because many of the flours have more interesting flavour and are more nutritional than wheat flour. We have quite a few things coming up – including cauliflower cheese soup, a new bread recipe, and turnovers! What a sweet story! I love it! I’d never heard of matrimonial squares before they sound really good. Thanks. I grew up with them. They’re my mother’s favorite! What a fantastic and precious story. I love the photo. Well done. Thanks! The plate was an engagement gift from my sister. Yum dates as a filling sounds delicious! Loving the history and simple recipe idea. And such a cute plate in the photo! Thanks so much! The plate was an engagement gift from my sister. Looks wonderful and loved the history behind the squares!